At last I get to posting this recipe after my teaser last week (what can I say, Paula Deen threw all of us off)! 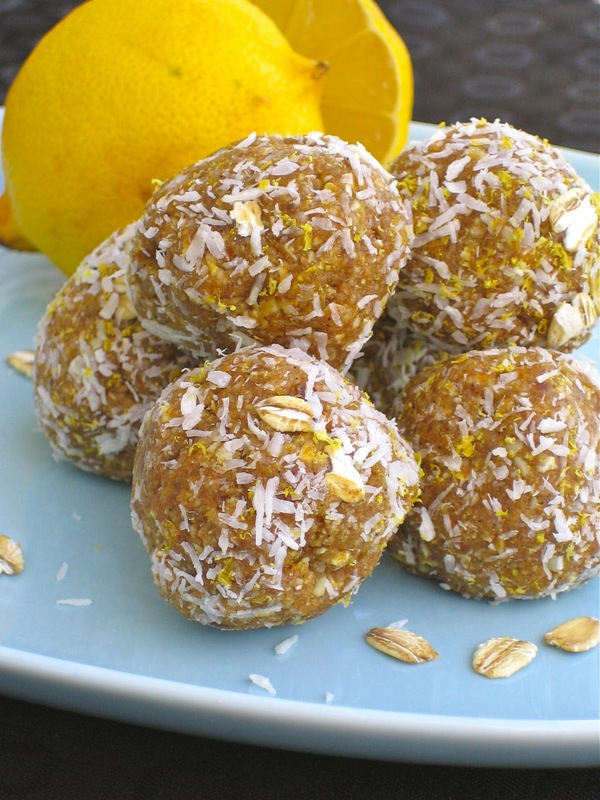 These sweets are truly a breeze to make, and are also truly healthy. They have no sugar, and offer a gluten-free option (if certified gluten-free oats are suitable for you). I created these after having visions of these lemon-laced bite-sized blondie-tasting sweets, but far healthier and even easier to make than a blondie square. The cashews deliver the buttery, blondie flavor and the oats help keep the mixture all together, for one easy, lemony-delicious bite! The beauty of this recipe is its clean and simple ingredients. The lemon really shines through, and combined with vanilla seeds the taste is pure and lovely. Sometimes the simplest things taste best, and this is one of those times. The recipe is now posted. Please let me know how you like them. I always love to hear from you. And, feel free to share the recipe on fb, twitter, or repost on your own blog. Share a lemon kiss, *smack*! Dreena.. I have been patiently waiting and crossing my fingers for these! Finally a use for all the cashew butter I bought at a sale ;). They look great. I'll be making them tonight! I haven't tested them with cashew butter instead of cashews - thinking you'd prob need a scant 1/3 cup, but texture may be stickier. Maybe you have some cashews handy too. Whichever... hope you like! Mmm they looks so tasty! I'm going to have to give it a test! Hooray! I've been patiently (and obsessively checking!) for this recipe. I'll be making them this week as I love anything and everything lemon. Thanks so much!! These sound fabulous! I have a whole slew of recipes for what I call dried fruit and nut "truffles". The blondie bites are going right to the top of my "to-make" list! Oh my sweet heavens, these look utterly delicious! I used to make a similar version of these as a kid. I forgot all about it! Yours of course are a much more gourmet version that I will be trying out for sure! Thanks! Anonymous, I haven't tested them with either, but I would think that almonds should sub fine. I wouldn't sub walnuts as they are more bitter (have a bitter note in their skins), and the are also more oily. Almonds are a closer match to cashews for this recipe, so I'd say you could give that a try. If you do, pls share how it works! Thanks everyone... hope you love 'em as I do! I realised as I was making these that they didn't have any cashew butter in them - but remembered how I'd commented about the cashew butter - how odd! Anyhow, we made them, they were so wonderfully quick to make and they were gobbled up all in the same day, and were pretty delicious. I was very surprised at how pleasant and important the lemon flavour was! These are great, and so much nicer than most raw desserts I've made. Thanks for the recipe. Holy Yum!!! This looks so good! I love your blog. I just started one of my own on healthy living. Watch for a shout out when I attempt this recipe on my own! I made these last week. Forgot the vanilla and used oranges instead of lemons. Had a hard time with the coating too. But they still turned out amazing... I loved them! Glad you stressed the patience part, by the way. I might have given up if you hadn't said that.